Gavin has been caught cheating again! Since October, he has increased global land temperatures for recent years by up to 0.03C, whilst lowering many years prior to 1970. As is usual, the adjustments are small, making them much harder to spot, and easily dismissed as just rounding up and down. Nevertheless, the cumulative effect of all the adjustments made over the years is significant. Clearly Gavin could not resist the temptation to have one more go before he gets the boot. No wonder Trump is keen to get NASA to be involved only with what it says on its label. One of the first things that Trump’s team should make them do is publish all previous versions and the justifications for the adjustments. If other professions were allowed to make quite so many after the fact adjustments, Bernie Madoff might still have been in business. FIrst: remove any ‘private server’ laptops, from NASA, from his personal possession and immediately back them up. Second: all in-house communication should simply be put in the public domain so we can see the collusion and politics, lying and cover-up. 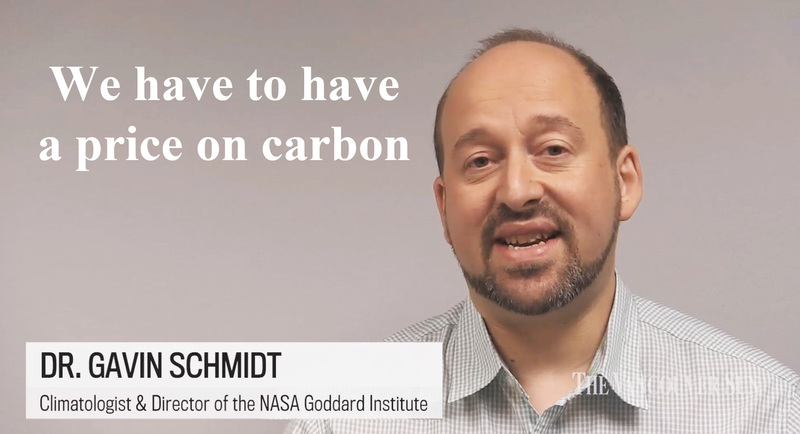 Lastly, dump the climate group and put NASA back at putting people in space. Every russian liftoff is a disgrace to the US. There must be a genuine reason behind this, other than the guy is stone mad. Sorry, but Gavin was last in line when God handed out looks. Sorry Gavin, but the ugly stick was working overtime. I guess you had to make up for it somehow. PS. Gavin, I don’t mind if you call me a denier any longer, I’m good looking. Well, the term is relative, and relative to you I’m effing stunning. PPS. Although Quasimodo is effing stunning compared to me. You have no chance Gavin, sorry mate. From the fawning write-up the Q&A will be rehearsed and I’d expect the front rows to be reserved for reliable true believer folk. Gavin is an outrageous liar. Next step – adjust the adjustments? But if he is seen to be on-side it must have a positive effect on his funding. This is another Canute moment. Canute famously denied the fawning retinue there vain attempts at preferment by actively demonstrating that he was no more or less man than they. It seems that Gavin is hankering to drown in his cause, be it in 5,000 years time. As long as there is preferment, notoriety, being the most biddable, adept at attaching to the reputation or ambition of those above you, there is no hope for truth to out. Perhaps, as an adjunct to publishing scientific papers the author should be subjected to the ducking stool or lie detector. Meanwhile the Isles of Man, Scilly, Orkney and Wight seem to be judging by other criteria. Schmidt? I think he is saving up for his retirement, which could come quite soon. Do we have enough information about the adjustments to do a high level review of whether the adjustments make sense? 1. Have some stations been adjusted both up and down? 2. Are many stations adjusted to fit a few (or one) stations, or vice-versa? 3. What percentage of stations are adjusted? 4. Are adjustments consistent, i.e. is a station always adjusted and always adjusted n the same direction and the same “amount”? 5. What are the gold standard stations used to make the adjustments? Rather than look at what was done to the data itself, these sorts of questions can show whether the patters of what was done suggest anything less than scientific. CNN: ‘Record-breaking wintry temperatures are gripping the eastern two-thirds of the country, signaling that this could be one of the coldest seasons in years. Across the United States, 76 locations have shattered their daily record cold high temperatures for December since the beginning of the month. That means some towns saw their coldest December day ever. Gavin has about 45 more days to do his dirty work. “Gavin has about 45 more days to do his dirty work.” or hide it if he can. I think that Trump promised to close NASA/GISS and move the function to NOAA. Not sure if a Trump appointee as NOAA Administrator has been appointed yet. I think that Senators Cruz and Lamar Smith are not going to sit idly by after 20/1. I think they both have unfinished business with NOAA and GISS. As I recall Lamar Smith had “whistleblowers” in NOAA feeding him information. The Carl et. all. 0.2C addition to the Argo floats data to “adjust” historical ocean temperatures is still ongoing. What scientist would adjust the most reliable information available to adjust unreliable data other than a “climate scientist”. There is some “fake news or data” for Obama to think about. Could I suggest another file to try to detect on the wayback machine? Although there are just three bands of latitude as graphs, the text file has eight bands. When I looked last year the most southerly band – slightly more than the Antarctic & 5% of the Earth’s surface has dramatically declining temperatures just when there was an early C20th warming in the Northern Hemisphere. Yet there were no permanent settlements on Antarctica (hence no weather stations) until the late 1950s. The most Southerly was Base Orcadas which is known for having highly erratic temperature trends. Yet these trends are largely replicated as Antarctica’s temperatures. I would quite like to know when these changes took place, and the impact on the global data. It may have been after 2011. Further to the above, based on a download in May last year, I re-downloaded the data and did a comparison. I did 5 year moving averages. The black line is the Global impact. There has been 0.05 degrees added to the late 20th century warming and further smearing out of the 21st Century stoppage in global warming. There has been further shrinkage of the early 20th century warming. 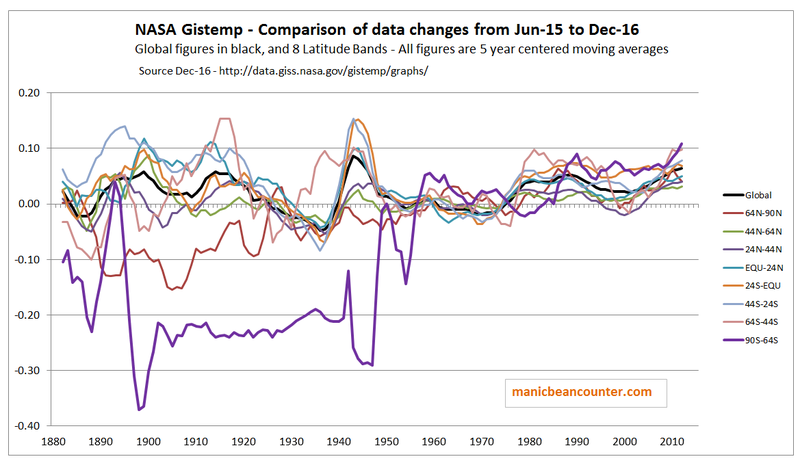 In terms of bands of latitude the biggest changes have occurred in the anomalous Antarctic data. Early twentieth century warming was shrunk by up to 0.25 degrees. Biggest changes in individual years are 1898 -0.51C, 1899 -0.49C and 1945 -0.89C. Non of the other seven latitude bands have anything like the adjustments. It suggests to me that this is due to the calculation methods rather than deliberate manipulation. Gavin and his co-workers have a biased methodology that is getting further and further away from the real world and more towards their beliefs about how the data ought to look.